This entry was posted in Podcast on March 28, 2015 by Chris Laxamana. Dr. Bruce, something that blew by is Sonny’s “therapist” is the school required therapy nonsense. Until that therapy industry bureaucrat’s dance card is filled, every kid in that school will be passing through that revolving door. A lot of Adam’s standard ideas come out on this episode. I always have the same (rather negative) reaction to them, and I often wonder if I’m the only one. Do regular Adam Carolla fans nod their head and agree with all this stuff? Or do most people find them hard to take? The first, of course, is his idea that the critics gave Road Hard negative reviews because they disagree with Adam’s politics and views on women, etc. He’s fighting like crazy against the reality that he just made a pretty bad movie. Full disclosure: I’m in the camp that thinks the 50% rating on Rotten Tomatoes is extremely generous. While watching Road Hard, I could hardly believe how awful it was. Forget about the bad writing, editing, and directing. Adam’s horrible acting alone was enough to sink twenty movies let alone this one rather weak rom-com. His acting was so bad, I found it hard to distinguish it from parody. In every scene, it seemed to me like Adam was doing an SNL skit to deliberately showcase how to act as badly as you can. Another of Adam’s greatest hits in this episode is the idea that rich and successful people like Mark Geragos and Tom Cruise are rich and successful because they work hard. I always find this incredibly insulting to pretty much everybody. I have no doubt that Mark Geragos and Tom Cruise work hard. But so does nearly everyone. My father worked hard. My teachers in high school worked hard. I work hard. Everyone I know works hard. I’m sure there are thousands of actors and comedians in California right now working very hard. The fact is that there is only so much room in Hollywood for stars like Tom Cruise.The fact that you aren’t a megastar has nothing to do with how hard you worked.This association that Adam makes between working hard and being rich always seems so strange to me. Okay, Tom Cruise worked hard and became a rich and successful megastar. Harry Dean Stanton worked hard and is a great actor. Does that mean there is something wrong with Harry Dean Stanton? Did he not work as hard as Tom Cruise? Most of the struggling actors, singers, dancers and comedians in LA are working extremely hard and we’ll probably never hear of any of them. I get tired of Adam constantly implying that if you aren’t wealthy, it’s because you don’t work hard. Adam also delves into his “hypervigilance” and attention to detail – something that he feels only he possesses. 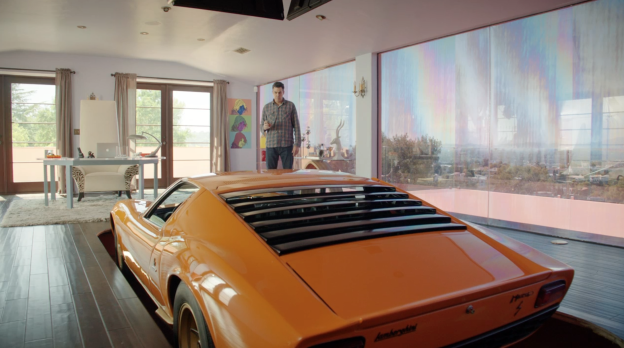 His big argument here is how he so masterfully measured the hole in the floor of his house to fit his Lamborghini. He premeasured the hole to exactly fit the pieces of flooring he was going to use. He went on and on about this like he was the only person in history to ever premeasure something to make it fit the building material. I hate to break it to Adam, but I’ve done that many times, as has every builder I’ve ever met. I get being proud of being a craftsman and taking pride in your work, but why pretend you are so awesome that you are the only person in history to do this? And somehow I have to think that he could have picked a better example. After all, we’re talking about an example that points out he’s the type of guy who would actually build a room inside his house to show off his Lamborghini. I’m not sure you want to highlight that. Donald Trump probably admires the hell out of the idea, but that’s not saying much. Another example of his professionalism and hypervigilance (that no one else on earth possesses) is how he wanted his team to start his live show immediately after the song “Hocus Pocus” ends. He didn’t want any of the next song to play. Unfortunately, there was a mistake, and after he said this, a bit of the next song DID play after Hocus Pocus. The problem with this story is that he already told it at length on the Adam Carolla Show. He dragged Dawson over the coals for this one. He made Dawson come on the mic so he could dress him down. Dawson apologized, admitted it was his fault, and said that he knew what he was supposed to do. The problem was that when he hit the stop/pause button on his iPod, it didn’t register and it kept playing, so he had to hit stop/pause again. It was a simple mechanical failure. But now Adam goes over it again – at length – this time making Gary come on the mic and explain. This seems pretty insulting and disrespectful after Dawson had already explained and apologized. Finally, and perhaps most importantly, Adam went over how his years spent studying with the Groundlings led to his skill as an improv artist and his success. I’ve got a few problems with this. The main one is that I don’t think Adam has much in the way of improv skills. The most painful parts of the podcast are when he tries to do an improv scene with Jo Koy or DAG. He’s a master at off-the-cuff humor and riffing on various subjects. But he’s not very good when he works with another person. I find I have to fast-forward through the Jo Koy bits. They just go on and on with Adam simply repeating the same thing over and over to prompt replies from Jo Koy. Adam is a solo artist in every sense of the word and he’s exceptional at being funny on any topic you throw at him like in the segment “What Can’t Adam Complain About.” But I don’t think he is very good at traditional improv – acting out a scene with another person. He’s a solo act, and traditional improv requires teamwork. I really had to smile when Adam gave as an example of improv skills a scene at a dinner party. (Adam goes to dinner parties??) One person mentions they went heli-skiing, and Adam says that improv training would teach you to say, “Wow! That sounds dangerous. Tell me more.” Without that training, a person would say, “I went zip-lining in Catalina!” First of all, saying “Tell me more” is not improv. That’s just being a good listener and being interested in what other people say. That’s normal human behavior. And Adam is the prime example of someone who DOESN’T do that. He’s the ultimate example of the guy who comes back with “I went zip-lining in Catalina” and tells his own story. You can hear it in this episode of the podcast. There are several moments where Dr. Bruce started to talk about something new, and Adam ignored him and dragged the conversation back to what he was saying earlier. I was also amused at Adam’s sweeping statements about all other actors and comedians. He said about taking improv training, “Nobody does it. No radio guy. No comedian. Nobody I’ve ever met has ever really done it. None of the stand-ups and none of the radio people.” I can only imagine how many comedians he has insulted with this statement. I’m as far away from the LA scene as you can get, and even I know that comedians take improv training. I’ve listened to a few podcasts from struggling stand-ups, and they all talk about the various acting and improv classes they are taking. OF COURSE they are. They’re pros and working at their craft and trying to get ahead. But in Adam’s world, no one does it but him. It’s very strange. This last part was crazy to me – this gratuitous insult to Bald Bryan. By this point in the podcast, Adam had managed to insult just about everybody on the planet including people who aren’t rich, actors who aren’t famous, anybody that builds anything, and Dawson. And for good measure, he now has to criticize his most loyal and trusted co-worker, Bald Bryan. Perhaps I’m overstating this, but it seems so crazy because casually saying he’d worked with “a million Bald Bryans” came right after a caller giving Bryan a nice compliment. I’m one of the people that find it hard to take. Your assessment of Adam’s words seems about right to me. As you say there are plenty of people already working very hard at what they do as well as people with keen observational skill so his thoughts on the subjects sound crass to me. I’ve heard Dr. Drew talk about the way Adam delivers his messages, and how many people don’t appreciate the language he uses as it makes him sound arrogant, to which Adam’s reply is F them. I still like to listen to Adam’s rants and keep tuning in to listen to his quick wit on various subjects for which I have a good respect. He reminds me a friend who is interesting in a conversation but is way too overbearing at times and could show a little more interest in what other people have to talk about.